The Cowboys have five Super Bowls, 12 Hall of Famers and a unprecedented aura as America’s Team. But come draft day, they’ve often been, um, April Fools. April 1 seems the best time to celebrate the Cowboys’ worst NFL Draft swings-and-misses. Lowndes Shingler. John M. Longmeyer. Lou Cioci. Ring any bells? Then how about Bill Van Bukleo? Sonny Utz? Linc Harden? Or the one and only Fallon Wacasey? Fuzzy memories of Lorenzo Bouier, Topper Clemons of Charvez Foger? If you’re a draft geek, you know that those are former picks of your Cowboys. And if you know your football, you know that they all sucked. Proving that drafting players is as much luck as science, the Cowboys have butchered picks and wound up with busts from the selections of Tom Landry-Tex Schramm-Gil Brandt to Jerry Jones-Jimmy Johnson and even Bill Parcells and Troy Aikman. 10. David LaFleur – Hand-picked by Troy Aikman to replace Jay Novacek, the 22nd pick in ’97 flopped with only 85 catches in 60 career games. 9. Bobby Carpenter – Drafted 18th overall by Bill Parcells in ’06, he never became a starter in Dallas and was eventually cut. 8. Felix Jones – 22nd overall pick in ’08 scored on a kickoff return in his first game, but never rushed for more than 800 yards in a season. 7. Shante Carver – Defensive was selected 23rd overall in ’94 (ahead of Larry Allen), but produced only 11.5 sacks in two seasons. 6. Tody Smith – Southern Cal stud defensive end was drafted 25th overall in ’71 but produced 0 sacks in 69 games with Cowboys. 5. Bill Thomas – The Boston College runner was taken ahead of Robert Newhouse in ’72, but never scored an NFL touchdown. 4. 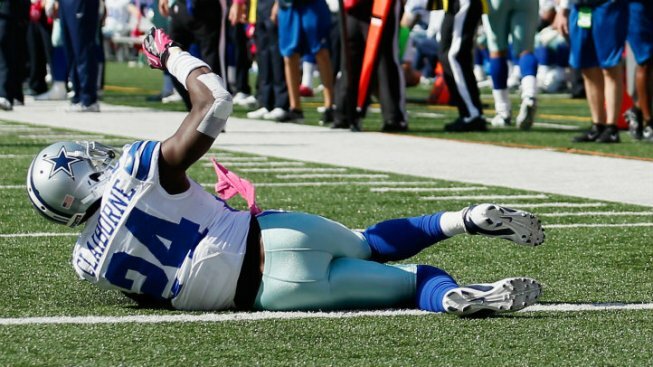 Morris Claiborne – They traded up to take him at No. 6 in ’12, but he doesn’t start and has a whopping three career interceptions. 3. Kevin Brooks – Forgettable defensive lineman picked 17th overall in ’85, one spot behind some guy named Jerry Rice. 2. Rod Hill – 25th overall pick in 82 wasn’t even good enough to flop, never starting a game for Cowboys. 1. Scott Appleton – University of Texas Outland Trophy winner was taken 4th overall in ’64, but instead signed with the AFL’s Houston Oilers and never played a down in Dallas.